This picture is of a Calamophyllia sp. 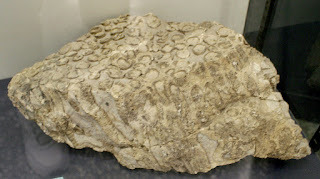 coral fossil at the Museo di Paleontologia at Sapienza University of Rome Italy. Corals like this existed in the Jurassic Period. The fossil was found in Monte Serra Colle Rufigno Bugnara Abruzzo Italy.